Mark explaining to Jean the 50kg weight difference..
We got up at 7am to another gorgeous day and began semi-frantically trying to deal with all the final preparations to be ready for a potential noon twin otter departure. Midway through Mark filming my master pre-expedition interview which we have been trying to find time to do for a week now Jean came in to the weather Haven tent cabin. “There is low cloud and flat light at our drop off point, we cannot fly today“….. In all honesty to me this was good news. I want to be 100% ready with every i doted and T crossed before we head to the edge of the Earth. In this context that means every clothes zip extended with a pull cord, every item designated a place, the pulks packed systematically and basically drilling everything here in this safe comfortable environment where life is 1000 times more mellow than out there. Although we could’ve scrambled to pull it together today it was a relief to know that we could square away everything properly. Which basically means bring spares of all the stuff you can’t survive or complete the mission without. Our final naked start weight is 210kg each. That means everything we have, including all our clothes. We will immediately depot 20 days of food and fuel where the twin otter drops us off reducing each load by 30kg. 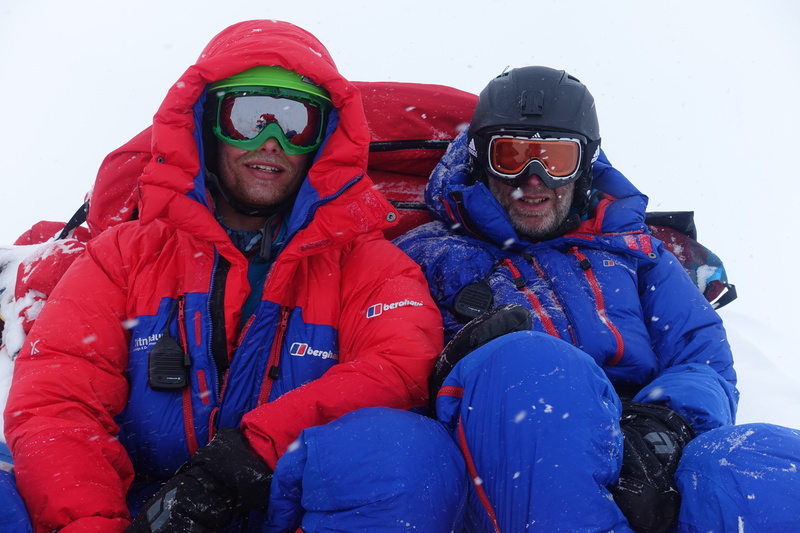 We will also be wearing or utilising a further 20kgs of kit in the form of down suits, skis, ski boots, kite etc. 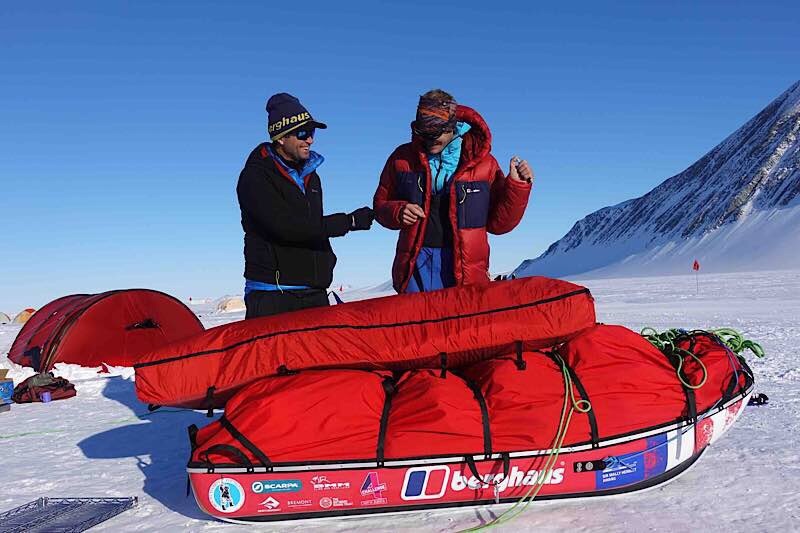 Therefore we are facing an initial payload of 160kgs which given a firm snow surface and as little as 5 knots of wind means the feasibility of this epic starting out as planned is high. There was some comedy in the weigh in process as Jean’s pulk initially weighed in at almost 50kgs heavier than Marks with mine somewhere in the middle. Much banter and name calling ensued with roars of laughter as we all abused each other for stitching or being stitched up. We decided to pack the fuel separately from the food, and the climbing gear and camera gear are not evenly distributed, so we all have different contents and therefore different loads. But as we accounted for the still pitched tents, the camera gear in use, and a few other variables, the weights began to balance. Helped significantly by the fact that Mark is a solid 10kgs heavier than Jean and I, which is a considered factor in the total payload and torque of the kite especially in very light wind . Mark is also 10 years older so I like to refer to him as the “fat old man”, a nick name he is not too fond of, but he knows that it is he who will be laughing as the exertion and cold begin to take hold. Since very soon after meeting Jean, I have called him “Auntie” Jean. In part because my wife actually has an auntie Jean and in part because I find that having and making fun with potential partners for big undertakings lightens the mood when the going gets tough. People who are playful and good fun to be around in a casual environment will also the most fun to be around when sharing a tent for 70 days and attempting difficult tasks in difficult places, so long as you are confident that they are in possession of the necessary skills to do the job. The very fact that we are willing to toy with each other to such an extent (it’s probably best I don’t share here my compadres pet name for me, clue: it starts with Captain and ends ….head) gives me great confidence that part by design and part by destiny we find ourselves out here together to do this. Mark and Jean are a pair of winners, and we are going to have a blast whatever happens. Although there is no question that I have been the leader of the project up until this point I’m glad to now feel that not only are we very much on an even keel but I actually feel slightly the junior partner, certainly on the kiting front which accounts for half of the days and 80% of the distance. 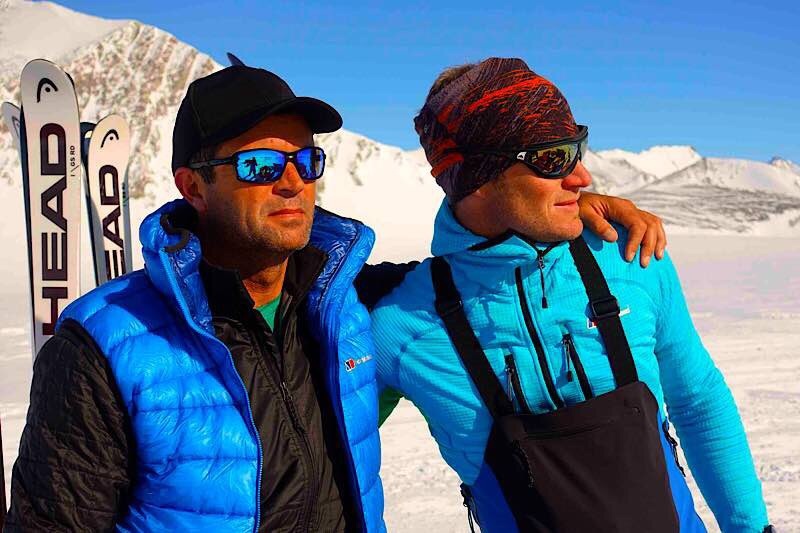 Mark has guided Mount Vinson (the highest peak in Antarctica) 5 times and has been kiting for 16 years. Jean is ten times more experienced than me at kiting. They can measure their kiting days in the thousands. I am confident in my piloting abilities but it is not second nature to me and I am nowhere near as slick and efficient with little over 100 days of kite flying under my belt. There is a lot of delicate faff with the ground handling of kites not to mention the intimidating power they possess when launched into stronger winds when attached to a massive load. There are benefits to being the junior partner; to perform at your best it is good to surround yourself with superiors. But there are also draw backs, nobody likes to be the one holding up the team and in kiting, a high speed activity, the weakest link in the chain can cause massive distance delays. But I’m not that much of a punter! Bruce and I did a 1600km kite trip across Greenland last year with no major drama I just haven’t launched a kite since February and am nervous about doing so in the gnarly conditions we’re going to face when we get up and out there! I’m sure after the first few sessions I’ll remember that I can do it and will soon find my flow. And when it comes to climbing, the tables will be turned. Jean has done lots of gnarly stuff; hard routes on the north face of the Grand Jurasses in winter, as well as hard aid Big walls in Patagonia and more. Mark has climbed loads of serious alpine routes, Big walls and wrote a coffee table book about the “Best climbing” in New Zealand (nb it’s in Australia!). But neither of them has spent as much time as I have on terrain like the south spur of the Spectre or climbing hard stuff in such remote locations. The Howser towers link up in the Bugaboos that Will Stanhope and I climbed in August, was not only a great way to get in shape but a massive confidence boost. Those perfect granite spires are similar in nature to the Spectre and it is a style of climbing I am particularly comfortable with, and good at. All in all, I think we are a solid team with complementary skill sets, capable of overcoming all the challenges ahead with grins on our faces. It’s not looking overly positive we will depart tomorrow, and if we don’t get out within a few days it’ll start to drag. But right now I feel very happy with our situation and prospects, and I am feeling extremely excited about confronting the Spectre face to face! Will you be making daily updates once you set of? Daily updates are the plan and live tracking as well. Subject to good satellite communications and warm fingers to type with..
What kites did you bring? from a soggy but not particularly wind swept Dewerstone. hope the kick off goes as planned.